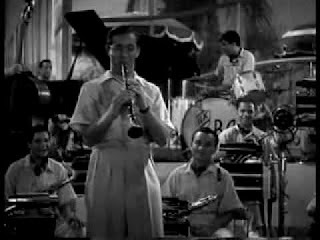 Benny Goodman’s monumental recording of “Sing, Sing, Sing” was a watershed moment in American popular music, one that redefined the scope of jazz and further cemented swing as the sound of the nation. 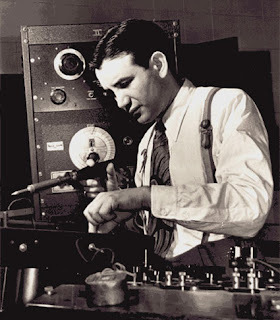 But Goodman weas not alone, as artists like Chick Webb and Raymond Scott were also pushing boundaries and making big band music that was every bit as ground breaking and compelling. Raymond Scott’s off-beat recordings are familiar to most people from the soundtracks of many classic 1940s Looney Tunes cartoons, where their frenetic energy and unexpected sounds fit in perfectly with the on-screen zaniness. His records were not originally made for that medium, however, and they are just as enjoyable on their own. “Twilight in Turkey,” for example, is a kinetic masterpiece with an uptempo beat that is carried by a variety of different percussion instruments, including at one point some finger cymbals. Meanwhile, the orchestra plays just as fast, their playing punctuated by frequent whining growls from a muted trumpet and several bizarre interludes – everything from an exotic-sounding Oriental dance to a dizzy saxophone solo to a confused, discordant clarinet. Somehow it all works and the end result stands as some of the most inventive jazz of its time. At his best, such as on “For Dancers Only,” Jimmie Lunceford created swinging records that rival the best work of better-remembered bandleaders like Goodman, Ellington and Basie. The genius of Lunceford’s band was the way it moved seamlessly as if a single entity, while still sounding loose and fresh. Except for two noteworthy solos, the instruments here stick close to the main melodic theme, but they make the most of that framework with colorful tone and a phenomenal arrangement by Sy Oliver. The two solos are highly creative and memorable: a spare turn on tenor sax by Joe Thomas that ends with “laughing” tremolo and a high, rallying cry of a trumpet solo by Tommy Stevenson that must have driven dancers crazy with excitement. This record should be on any swing music fan’s short list. While limited to just over three minutes per side on a standard, 10-inch 78 RPM record, many jazz bands would stretch songs out much longer in live performances. In 1937, Goodman and his band recreated this in the studio, creating an epic eight-and-a-half minute recording that filled both sides of a 12-inch record (the split coming in the middle of an extended drum solo), a format usually reserved for classical music. That recording of Louis Prima’s “Sing, Sing, Sing” was a game-changer and has continued to be one of the most recognized jazz records in history. Right from the start, Gene Krupa’s drums command the listener’s attention with a propulsive intro. As the rest of the band joins in, it turns into an enjoyable, fairly straight-forward swing number with excellent arrangement by Jimmy Mundy and a hot clarinet solo by Goodman. But Krupa’s drums never go away; underneath the melody, he’s still banging out that rhythm like a man possessed, and when all of the other instruments suddenly disappear just before the two-minute mark, you realize that this is not going to be your average swing number after all. Those drums are unstoppable, and every time the orchestra stops, Krupa bangs and bangs until he summons them back, sometimes en masse and sometimes one instrument at a time. Some of the best moments are the free form solos taken by Vido Musso on tenor sax and Goodman on clarinet against just that drum beat. Especially thrilling, though, are the full-orchestra moments in the second half, where the band seems to be rushing recklessly forward, barely able to control itself, pushed forward by that incessant drum beat. When the song finally comes to a sudden end, if you’ve been paying attention, you should find yourself out of breath! One cannot say enough about how talented Chick Webb’s band was. Before their leader’s untimely death in 1939, no other band in new York could touch them. “Harlem Congo” is a perfect example of their prowess, a performance as fast-paced and lively as the city it represents. The whole band is phenomenal, but special attention goes to Taft Jordan’s show-stopping work on trumpet and Chauncey Haughton’s solo on clarinet, which starts ridiculously high and fast before taking a whirling plummet downward. And lest anyone forget who the best drummer in the business is, Webb settles the argument with a final drum solo that pulls out all the stops. When he is finished, the rest of the band returns for a slow, sweet coda as if taking a well-deserved bow after such a dazzling performance. As if his band wasn’t already talented enough, Webb had the good fortune to discover a talented teenage singer named Ella Fitzgerald in 1935, and she was soon accompanying the band on performances and in the studio. 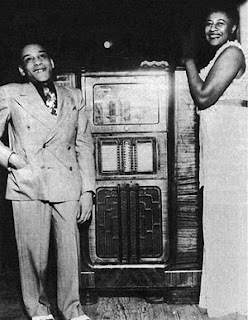 Although she was an awkward “diamond in the rough” at first, as Webb put it, she would go on to establish herself as one of the all-time premier singers in jazz and popular song. “A-Tisket A-Tasket” was her break-through hit with the band, with lyrics updated by Fitzgerald from a popular nursery rhyme. Those lyrics would be forgettable in lesser hands, but Fitzgerald’s vocal control and innate sense of swing allows her to transcend their silliness and turn in a thoroughly riveting performance. She delivers the lines sincerely and yet not without a playful wink, especially when she banters back and forth with the band: “(Was it green?) No, no, no, no / (Was it blue?) No, no, no, no / (Was it red?) No, no, no, no / Just a little yellow basket!” The band’s playing is highly arranged to provide the perfect background for the vocalist, but the lack of their usual “hot” soloing does not turn out to be a disadvantage. Try to listen to this song once paying attention only to the instruments, and you will hear a flawless blend of heavenly sweetness and lively energy that is as impressive as anything in their catalog. “A-Tisket A-Tasket” proved such a monstrous hit that it helped propel the band to a new level of fame. Unfortunately, Webb himself would die the following year at age 34 following a lifetime of health problems, and it would be up to Fitzgerald to carry on as bandleader.